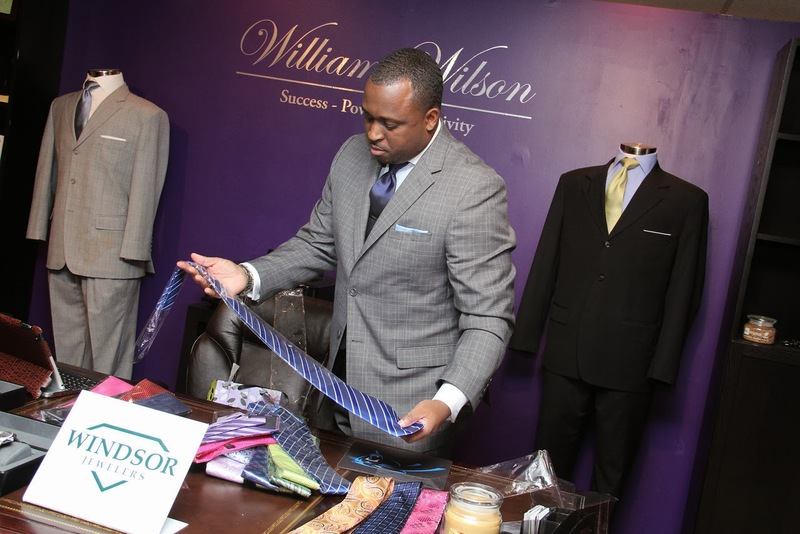 William Wilson, CEO of William Wilson Clothing, has opened a new showroom for his custom clothing line. The Charlotte-based designer makes custom men's suits, shirts, and neckties for his namesake brand, which he launched in 2008. I met William about two years ago and have seen his brand and notoriety grow tremendously during that time. I attended the private grand opening event he held on Monday. William Wilson shows merchandise at his new showroom. Photos by Marissa Carter. See more. His new showroom, located in a great storefront space in the Coffey & Thompson building (near the corner of West Morehead and South Tryon streets, where Uptown meets South End), represents the growth of his company. 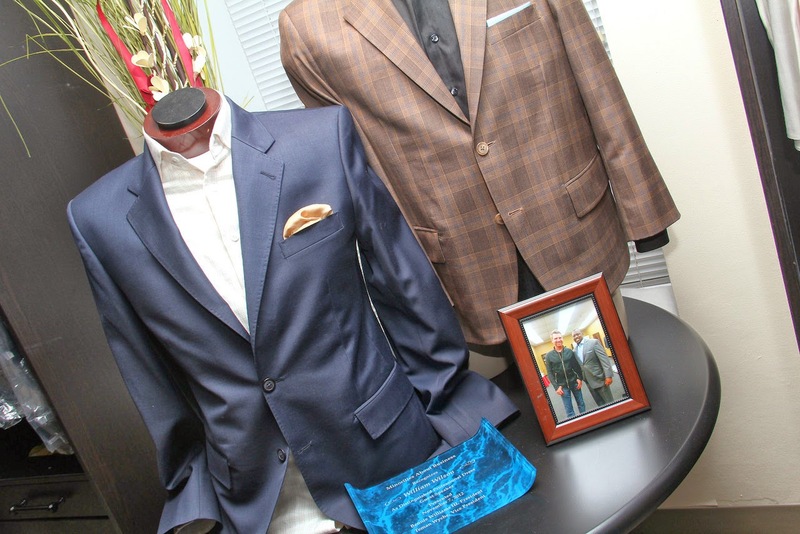 It's not easy getting a clothing line off the ground--all of his custom label suits are handmade--but William has managed to make suits for several professional athletes, including Carolina Panthers players and NASCAR drivers. In fact, he now designs the jackets for the winners of three NASCAR Sprint Cup series races--the Coca-Cola 600, Bank of America 500, and Sprint All-Star Race--as well as the Chiquita Classic golf tournament, and the Bronko Nagurski Trophy (presented by the Charlotte Touchdown Club to the best college football defensive player in the nation; 2013 award is being given out December 9). At the showroom grand opening, I learned that William has recently launched William Everette, his first ready-to-wear collection of business suits. As he explained, this allows him to serve clients who can't afford to pay thousands of dollars for a custom suit, but he can still make quality suits they can buy off the rack for a few hundred dollars. Another thing I'm impressed by is the humbleness that comes across from William when you're talking to him. At Monday's event, he repeatedly thanked and gave credit to the people he says have helped him along the way and have been instrumental to his success. He also talked a lot about the role God plays in his life. I never hear Donald Trump talking like that! William Wilson Clothing, 109 W. Morehead St., williamwilsonclothing.com. Follow William on Twitter @TheClothier.